The Alan Guttmacher Institute surveyed over 1,200 patients undergoing induced abortions at 11 large-scale abortion facilities in the United States. The women were asked to list all reasons for seeking abortion, singling out the primary reason. An additional 38 women at four sites were interviewed in-depth. The two most common reasons women gave for aborting were "Having a baby would dramatically change my life" (74%) and "I can't afford a baby now" (73%). Concerns about their own health were mentioned by 13% of the women, while 12% mentioned concerns about the baby's health, though only 3% and 4% respectively gave those as their primary reason for seeking abortion. 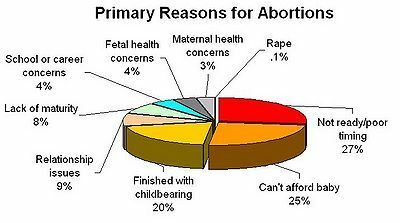 Interestingly, only 14% indicated "husband or partner wants me to have an abortion" as a reason, down from 24% in a previous survey in 1987. This dramatically departs from research on women post-abortion, among whom 64% reported feeling pressured by others to abort. Surprise or shock is often the initial reaction to the validation of pregnancy. Caplan (1959) indicated that initial rejection of pregnancy is common, but that it is generally followed by acceptance at the end of the first trimester. M.J. Daly has noted that the legitimately pregnant woman, and often those illegitimately pregnant too, are ambivalent to the pregnancy. This ambivalence is so universal that it may be considered normal in the first trimester. Ambivalence is another emotional response observed in many pregnant women. .... Surprise or shock may be the initial reaction, followed by very mixed feelings. .... Rubin believes that few women who become pregnant feel ready 'now.' .... Initial rejection of the pregnancy is common, Caplan states, but it is usually replaced by acceptance by the end of the first trimester. [Members of the 1955 Planned Parenthood conference on abortion] agreed, and this was backed up by evidence from the Scandinavians, that when a woman seeking an abortion is given the chance of talking over her problem with a properly trained and oriented person, she will in the process very often resolve many of her qualms and will spontaneously decide to see the pregnancy through, particularly if she is assured that supportive help will continue to be available to her. Ambivalence and rejection usually resolve when the unborn baby becomes more real to the woman, typically at "quickening" in the days prior to ultrasound. That this ambivalence and rejection resolves itself readily is born out by the finding that about 80% of women who see an ultrasound of their fetus (unborn child) decide not to abort.